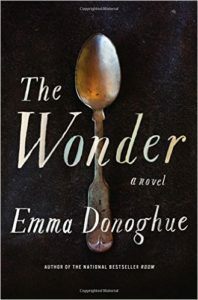 Though it took me a couple of chapters to get into this latest by Emma Donoghue, staying with it paid off. It’s sometime after the Crimean War and a British nurse, Lib Wright, is sent to a remote village in Ireland. Lib was trained in the “new” nursing methods by Florence Nightingale and she has been hired by a committee of locals to help verify (or disprove) that a miracle is taking place. A young eleven-year-old girl, Anna O’Donnell, stopped eating four months before and still seems happy and healthy, thanks to being sustained by “manna from heaven” as she tells it. Lib comes into the situation both a bit dismissive of the Irish community she’s entering and convinced that this “miracle” is simply a con perpetrated by the girl and her family. She and a local nurse, who is also a nun, are required to take eight hour shifts over a two-week period to make sure that no food is passed secretly to Anna, but Lib isn’t even sure she can trust the other nurse because of her spiritual beliefs. With each day of the watch, Lib becomes more fascinated by Anna, a girl with deep religious convictions, who truly seems to believe that she is sustained by God and who is wracked with concern that her recently deceased brother is stuck in purgatory. The fact that Anna starts to decline health-wise as the watch continues only makes Lib more sure that the girl was being fed before but now is slowly being starved. How can Lib save Anna from herself and from the community that wants this miracle to be real? Donoghue, who is most famous for Room but whom I first encountered when I read Slammerkin, is a master of recreating times and places in the past—whether it’s the slums of London, a newly built San Francisco, or a poor Irish village. She creates strong and complex women characters that I never regret spending time with and this novel is no exception. Share the post "May There Be No Frost on Your Potatoes"
By day (and night really), I teach writing and run a writing center at a community college in the Chicago suburbs. However, my superpowers include racking up large library fines and creating towering stacks of to-read books next to my bed. Why Do You Think Anything in that House was ever Yours to Take?